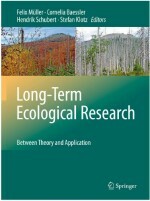 Edited by F. Muller, C. Baesler, H. Schubert, and S. Klotz, this book focuses on studies dealing with the investigation of complex, long-term ecological processes with regard to global change, the development of early warning systems, and the acquisition of a scientific basis for strategic conservation management and the sustainable use of ecosystems. Theoretical ecological questions of long-term processes, as well as an international dimension of long-term monitoring, observations and research are brought together. The outcome is an overview on different aspects of long-term ecological research, including “Twenty-eight years of the US-LTER Program: Experience, results, and research questions,” written by Jim Gosz, Bob Waide, and John Magnuson. This book will be of interest not only to ecologists, conservation biologists, biodiversity scientists and environmentalists, but also to administrators of protected areas and natural resource managers.